Home ParentingPregnancy	Did You Ever Forget That You’re Pregnant? That seems like a silly question, doesn’t it? I mean, I have a hard time believing someone doesn’t know they are pregnant until the moment they give birth on the toilet, so how the heck could I forget that I am indeed eight months pregnant. Maybe forget isn’t the right word. See, when I was pregnant with my daughter, I was hyper-focused on my pregnancy. I ate, breathed and slept pregnancy. I was a total preggo book junkie, I watched baby shows (yes, really LOL), I dreamed about my pregnancy, and I talked about it every chance I got. 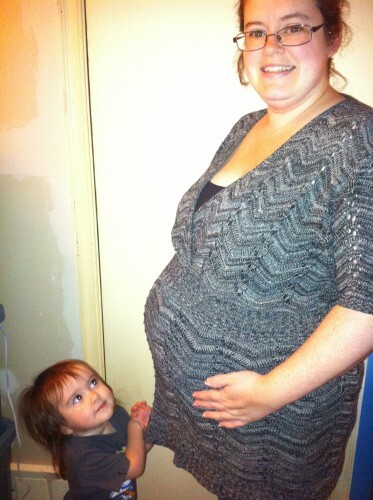 (Funny thing though, I didn’t really take advantage of my blog like I should have for sharing my pregnancy). And baby boards and forums? I spent waaaay too much time on those. I was also very conscious about looking pregnant. Already being self-conscious about my weight I nearly wanted to scream from a mountain top that I wasn’t merely fat anymore – I was PREGNANT! This time? Well, this time I don’t have a full-time job outside the home and I have a toddler to chase around and entertain all day long. I notice things like how many attempts it takes to get out of my chair, how often I need to pee and eat, and the heart burn. Oh my gosh the heartburn is brutal at bedtime. But this second pregnancy isn’t my main focus day in and day out. It’s there, but sometimes it takes a strong kick from him to be reminded to take it easy. Or, a pinched nerve that makes wonder why I hurt so much. I think the distraction my toddler provides (she’s a good one, don’t get me wrong!) is going to put me in panic mode yet. The time is flying by and I feel like I’m not getting anything done. It’s also like I’m tuning out just what it’s going to be like to adjust to two little ones in the house. Am I nervous? Heck yeah. Do I think I handle it? Hmm, yeah, I know I will figure it out. I need to get my game face on though with less than two months to go. The first thing I need to do is take control of my calendar! I keep scheduling things in like a blog conference when I’m 35 weeks along and a toy fair when I’m 37 weeks. I know, I’m crazy. Part of this “forgetting” is not defining a plan for my blog while I’m on “maternity leave.” Granted I can’t take leave the way I did when working outside the home, but I’m going to need some time off. Again, it’s in the back of my mind, but I keep thinking I can do it all. One of the downfalls of working from home, I suppose. Did you notice how differently you focused on your pregnancy progress with subsequent children? Definitely! I have three kids and by the third pregnancy, it could no longer be something I focused on. I even feel that the morning sickness was less the last time because I was so busy I couldn’t think about it. And each pregnancy went by faster than the last! I’m glad it’s not just me! Sometimes I feel like this baby is not getting proper pre-birth bonding time or something. I can’t compare myself to you because there’s a big age difference between my two daughters – 12 years. With the curiosity of my older daughter and a very worried husband, there was no way I could forget that I was pregnant! I wish the best with your pregnancy. It will all work out. Thanks 🙂 I do think the young age of my daughter plays quite a role in my memory lapses. It’s hard not to focus on a toddler!